The lobster was tucked in against the trunk, at chest height, almost politely, yet as obvious as a magazine in a supermarket checkout stand. Six thousand feet above sea level in Banff National Park two wardens paused at the side of a backcountry trail. Their exhalations steamed in the January air as they stared at a tree ornamented by a two-pound Atlantic lobster in a resealable plastic bag. “I’ll get this one,” Rick said, unslinging the harness to the skier rescue sled they’d brought with as a training exercise. “If I reported this, I’d feel pretty sheepish,” he noted. Snow had fallen since the ski tracks diverged from the main trail to the lowest branch of an alpine fir. The lobster was tucked in against the trunk, at chest height, almost politely, yet as obvious as a magazine in a supermarket checkout stand. He picked up the lobster, glanced at the sled, imagined how the rescue scene would look to a passing skier, and stuffed the crustacean embarrassment into his backpack. “‘Littering’ stops a fair ways short of describing it,” Rick continued. “They’re throwing them away awful careful,” Rick said. “Seems more like people putting things out of order to me,” Rick said, as they skied up the trail again, scanning as they went. “There’s no free lunch,” Niles said, turning his gaze from the bush long enough to wink. “There’s another one,” said Rick. “I’ll get it.” Niles returned with a dozen assorted doughnuts in an unzippered bag. “Now that’s grim.” The next cache held bars of Swiss chocolate. “I don’t see how this is going to end well,” said Niles. The next stop yielded a Dungeness crab, which, strangely enough from Rick’s point of view, seemed to lift Niles’ spirits. When Rick’s turn came for the next pickup, though, he did his best to stuff the food away before Niles could see it. After several miles of their strange biathlon, the two started to feel the weight of their accumulated loads and looked forward to dumping them inside the familiar green walls of the next warden’s cabin. On their final approach however, it became apparent that those walls had turned reddish brown, and that food wasn’t the only thing on the trail that had been repackaged. 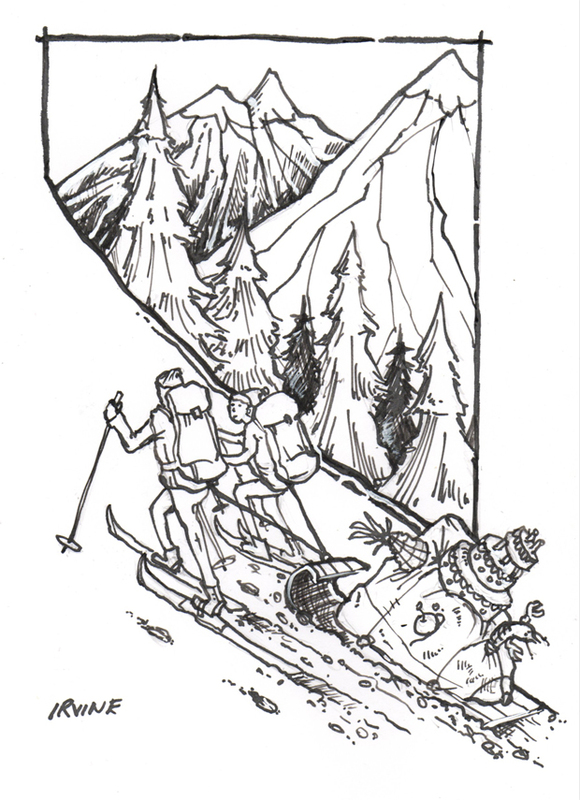 They skied in silence to the doorstep of the cabin and both just stared awhile. “Which is?” Rick checked the ski tracks around the cabin. It remained clear that they were dealing with only one perpetrator. They got into their skiing rhythm again and continued on. The food-strewn path could have led them toward Skoki Lodge, but instead continued along the less traveled parallel valley. “Looks like he’s headed for Baker Lake one way or the other,” said Niles. The two men talked less and less as they made their final ascent toward the Baker valley. Their packs filled and the pile of food on the sled grew. Where the tracks diverged to make food dumps, fresh snow covered the parallel tracks left by previous skiers. They put skins on their skis to keep from slipping backwards and took turns pulling the sled, but still strained to make the summit. They’d passed above tree line. In the open, the food caches seemed farther apart. At the junction below Deception Pass, though, the breader made up for the lull. Niles hung his head and looked away. The two of them turned their backs on the Sawback Range and looked west, where they knew the sun was setting, but the sky had turned overcast again, and a distant curtain of falling snow blocked their view. There was snow enough for a cave, fat enough for a fire, but the two neither dug nor burned. Despite the exertions behind them and the sixteen hours of darkness ahead, neither man touched even the rations he’d brought with him. As if politely awaiting a dinner guest, the two of them pitched their tent beside the inscrutable pyramid and huddled inside, stomachs growling, as the wind began to howl. Ivan Dorin has had his work included in the online high school English course of the Government of Saskatchewan, on CBC Radio’s Alberta Anthology radio program, and in Tesseracts Thirteen, Evolve Two, On Spec, GUD, and Vox.